Published by Upside Down World, February 25, 2012. The U.S. is about to get a whole lot more involved in extracting Mexican oil, according to an agreement which promises to open up offshore oil and gas drilling in the Gulf Coast, signed Monday by Secretary of State Hillary Clinton and her Mexican counterpart Patricia Espinosa. On top of pushing more underwater drilling into an area still recovering from the BP Deepwater Horizon disaster, the deal foreshadows an even closer relationship between foreign oil companies and Mexico’s state owned oil company, Pemex. Though the tone of Monday’s meeting was rosy, the agreement signals increased U.S. involvement in the oil sector of a country at war. “The government lacks the territorial control to guarantee security, as has been demonstrated in the gas deposits in the Burgos basin, and if federal authorities don’t have the capacity to provide security tocompanies on land, they will be far less able to do so in the high seas,” wrote Oscar Contreras Nava in the Gaceta, an online paper published out of Ciudad Victoria, Tamaulipas. According to the U.S. State Department, “The Agreement provides a legal framework for possible commercial activities at the maritime boundary and sets clear guidelines for transboundary developments….It establishes incentives for oil and gas companies to voluntarily enter into arrangements to jointly develop any transboundary reservoirs.” The U.S. Department of the Interior notes this underwater area – some of which was previously under a drilling moratorium – contains up to 172 million barrels of oil and 304 billion cubic feet of natural gas. Exactly what kind of incentives the Transboundary Hydrocarbons Agreement will offer to the oil and gas sector is not yet known, as the deal won’t be made public until it is presented to the Mexican senate for approval next week. “Mrs Clinton also stressed that it would allow US companies to work in partnership with the Mexican state oil company Pemex for the first time,” reported the BBC, suggesting an even cozier relationship between the oil companies of the two nations. But it will be far from the first time US companies have worked with Pemex: on the heels of the 1994 North American Free Trade Agreement, the state owned oil company sought international participation in the exploitation of the Burgos basin, located just inland from the Gulf of Mexico. The Burgos basin has since experienced over a decade of activity on the part of U.S. and international oil service companies, including Schlumberger, Halliburton, and Weatherford International. The U.S. Geological Survey said in 2003 that Burgos could contain more than six billion barrels of undiscovered oil, and over seven trillion cubic feet of gas. The Burgos basin is centered around Reynosa, Tamaulipas, covering an area about the size of Ireland in a border region that has become one of the most dangerous parts of Mexico. Much of the violence in Tamaulipas stems from the 2010 split between the Gulf Cartel and their armed enforcement wing, Los Zetas, as well as the deployment of 8,000 troops throughout the state. Ciudad Mier, which sits atop the Burgos basin, experienced intense, midday gun battles that caused at least 400 families to flee in 2010. Gun battles and kidnappings of oil workers have also forced Pemex to shut down oil production at drilling rigs in the Burgos basin. “Pemex hides cases [of kidnappings], there’s more than 20 people disappeared in our union,” said another man I talked to in Reynosa, who has been working for the company his entire working life. “They just are marked down as missing work,” he said. 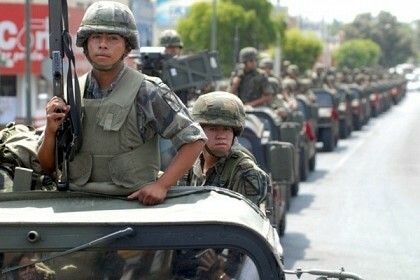 A military base with least 650 soldiers was opened in Ciudad Mier in December of 2011. Theft of petroleum products by organized crime is also a common occurrence. As much as 40 per cent of natural gas condensate production from Burgos is rerouted and stolen. Last spring, Pemex filed a lawsuit in Houston against ten U.S. oil and pipeline companies for collaborating with organized crime to purchase condensate stolen from the Burgos basin in Mexico. The Burgos basin is just one of the oil and gas rich areas along Mexico’s north border. New discoveries of shale oil, recoverable through a process known as fracking, have recently been announced throughout northeast Mexico, including in the states of Coahuila, Chihuahua, Nuevo Leon, Tamaulipas, San Luis Potosí and Veracruz. These regions have all been militarized as part of war on drugs. While the agreement signed Monday appears to apply only to companies active offshore, it signals an important step in Mexico-US oil cooperation. The future of Pemex is one of the key issues in federal elections coming up this July. The Institutional Revolutionary Party (PRI) candidate Enrique Peña Nieto, who leads in polling, has indicated that if he’s elected, privatizing Pemex will be among his priorities. “We can do what Brazil did for its oil company, not at the beginning but later, if we open shares to the public,” he told Bloomberg News last November. The transboundary hydrocarbons agreement was signed in an “informal” meeting of G-20 foreign ministers, which took place in Los Cabos, the southernmost municipality on the Baja peninsula. The meeting was a precursor to the G-20 summit, which will take place in Los Cabos in June.